College hoops fans and MMA fighters should wash out their mouths with soap. I have to confess. It’s an overdue confession over the one thing I’ve stolen in my life. Be sure to notice the poop. The subject of this grand theft is in the photo. 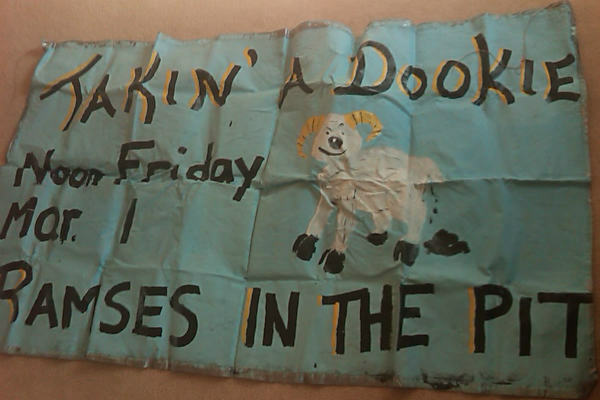 It’s a banner that was hanging in The Pit, the nexus of student life at the University of North Carolina, a couple of days before a UNC-Duke basketball game. I had seen the banner earlier in the week when I came over from Duke to visit, and I thought I simply had to have it. On this particular morning, I was at The Pit in the predawn hours as part of a routine college prank. I came prepared with a pair of scissors to snip it away. The only other person in The Pit was a sleeping Gulf War protester. The perfect crime. Maybe I already knew I was going to be surrounded by North Carolina grads when I went into journalism. (I had no idea I’d marry one of those Carolina J-school grads.) Or maybe I was just growing up. So today, I get a little puzzled when I look at my Facebook feed around a Duke-Carolina game and see all sorts of hostility. A certain veteran sportswriter, someone you’d think you could count on to see things from a dispassionate point of view, spews the same sort of nonsense I spewed as a sophomore. For one thing, we Official Mainstream Media Sports Journalists learn quickly that the athletes rarely have the same passions as the fans. College hoops players all have connections from AAU and camps. They just picked different schools. Pro athletes have far less control over their team choices and far less reason to care, which is why I’ll give my obligatory Lifton shoutout and tell him to calm down about the Redskins and Giants. In MMA (which some of you know as “UFC” or perhaps “killboxing”), the athletes have tremendous mutual respect. Go to a Fan Expo or a tryout for The Ultimate Fighter, and you’ll see a bunch of people acting like they’re at a class reunion in which most of the class got along great. It’s a mutually supportive group of people trading stories about their careers and their training. Then they get on mats and try to tear each other’s arms off. It’s a beautiful thing. And perhaps that’s one reason why I’ve had misgivings about the rise of the latest breakout star in women’s MMA, Ronda Rousey. Or why I’m far less interested than the typical MMA fan in the blood-feud main events of the sport — Chael Sonnen-Anderson Silva, Jon Jones-Rashad Evans, etc. My tastes are not popular tastes, of course. I’m the one who loves the Olympics and prefers a good biathlon party to a Cold War staredown. For me, the 1980 hockey memories and the fantastic film Miracle are more about the triumph of the underdog than some Commie-smacking propaganda moment. But if I’m an old fuddy-duddy, I’m guessing I’m not alone. A few years ago, Maryland had a good run in basketball and tried to play itself up as Duke’s new rival. Didn’t work. The Terps’ fans had all of the nastiness and none of the creativity. When one side isn’t worthy of respect, the sport suffers. Disrespect leads to the insanity of putting out bounties for injuring opponents in football. It leads to the tragedy of soccer hooliganism. And it’s a lot less fun than a biathlon party.